Terms: Minnesota residents add 7.275% sales tax per set. Shipping via USPS Priority Mail is $13.60 per set to US addresses, $45.95 per set to Canada, and $75.95 per set to other countries. Personal checks allowed 5 business days to clear before parts will be shipped. All sales final. 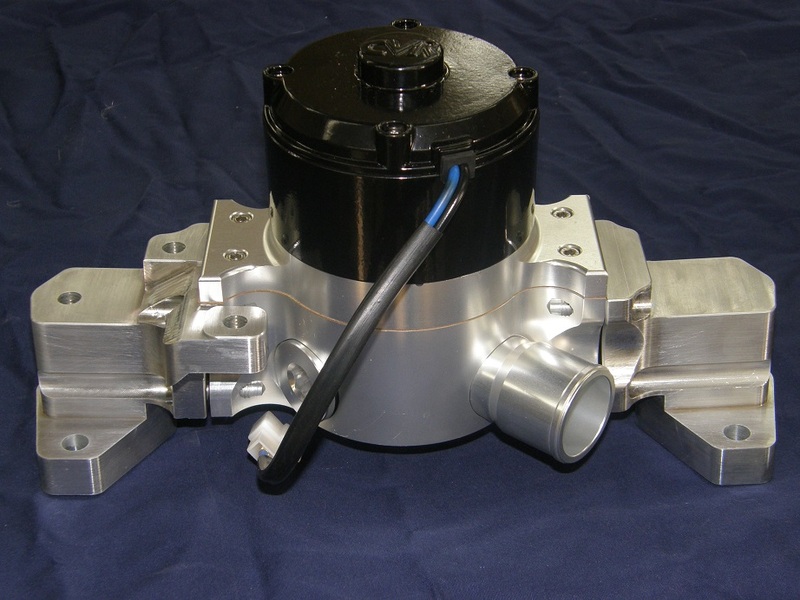 Electric water pumps are a popular choice for street performance and race engines. Removing the drag on the engine from the stock water pump frees up about 10 horsepower (see the dyno data at right), and provides a cleaner look to the engine compartment. Unfortunately, the available electric pumps that bolt on to the FE engine are limited to lower capacity units in the 35 to 42 gpm (gallon per minute) range. These pumps may not be sufficient for cooling a high horsepower street engine, at least according to one major manufacturer of the pumps. In addition, installing these pumps normally requires fabricating mounting brackets for any water pump mounted accessories, such as the alternator or power steering pump. 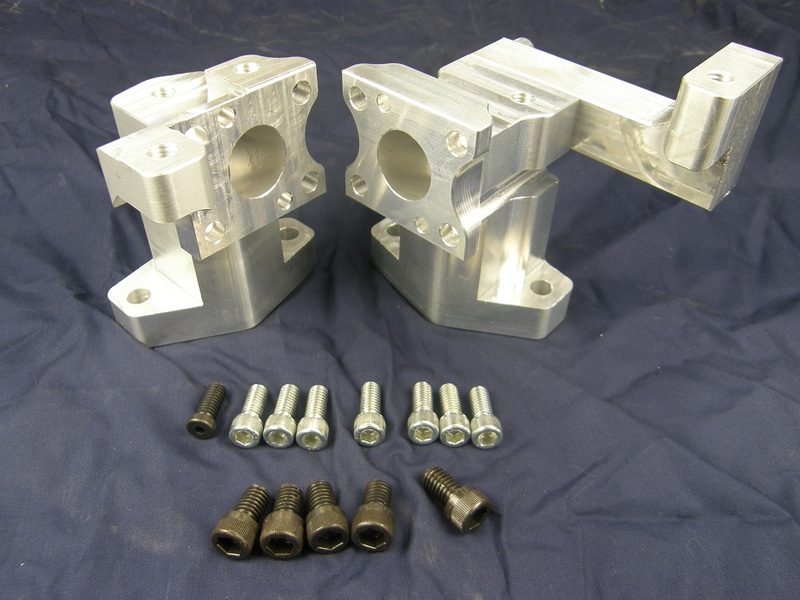 The billet aluminum adapters shown here make it possible to use the universal-style electric water pump available from CVR Products. CVR's Proflo Extreme universal pumps have a high flow rate of 55 gpm, and allow the manufacture of custom adapters to fit different engines. The adapters manufactured at FE Power bolt the CVR Proflo Extreme universal electric pump onto the FE engine block. They use O-rings rather than gaskets for sealing the pump to the block, and versions are also available that provide mounting points for the stock alternator and power steering brackets, if desired. Shown at right in the top photo is part number 12001; this is a plain pair of the water pump adapters. 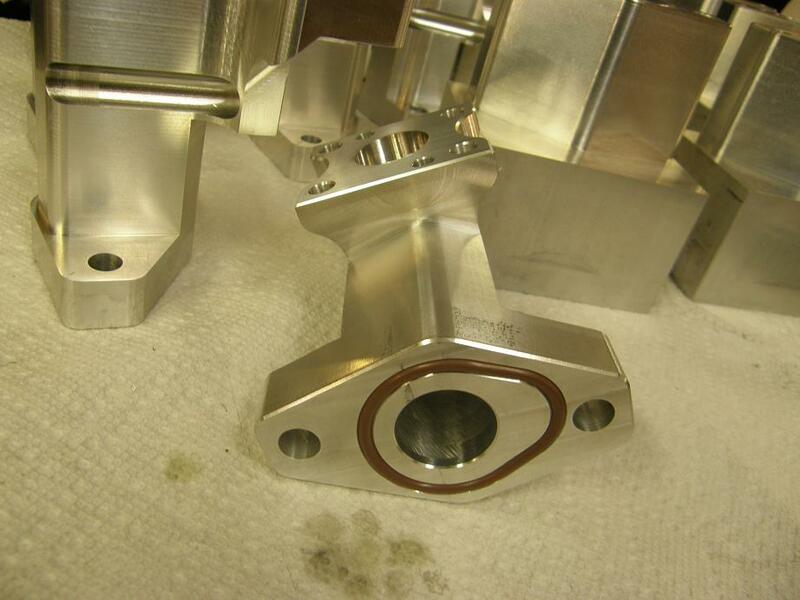 Part number 12002 is shown in the second photo; this pair of adapters has the right side adapter machined so that factory alternator brackets will bolt on, with only a slight modification (see the instructions). The bottom photo shows part number 12003; this pair of adapters accepts the factory alternator brackets and also the factory power steering bracket. Along with these adapters, the CVR pump and inlet tube must be purchased separately to complete the electric water pump system. 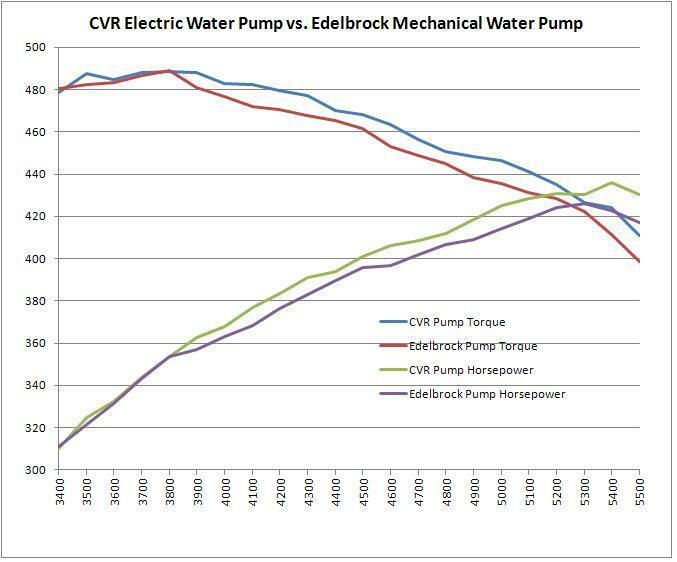 The photo above shows a back to back dyno test of an Edelbrock mechanical water pump versus the CVR electric water pump with the FE Power water pump adapters, on a 428 Cobra Jet street/strip engine. Power was gained starting at around 3800 RPM, peaking at around a 10 HP increase. The photo above shows part number 12001. 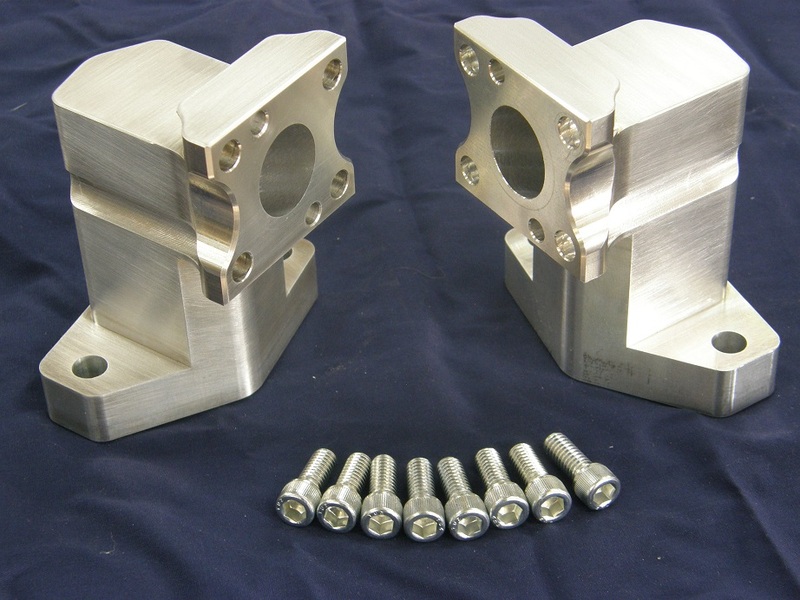 This pair of adapters is plain, with no provision for mounting factory alternator or power steering pump brackets. Price is $145.00 per set. The photo above shows the O-ring seal on the driver's side adapter. The O-ring on this side is fit into an oblong groove, to fit properly on the factory block's driver's side inlet hole. 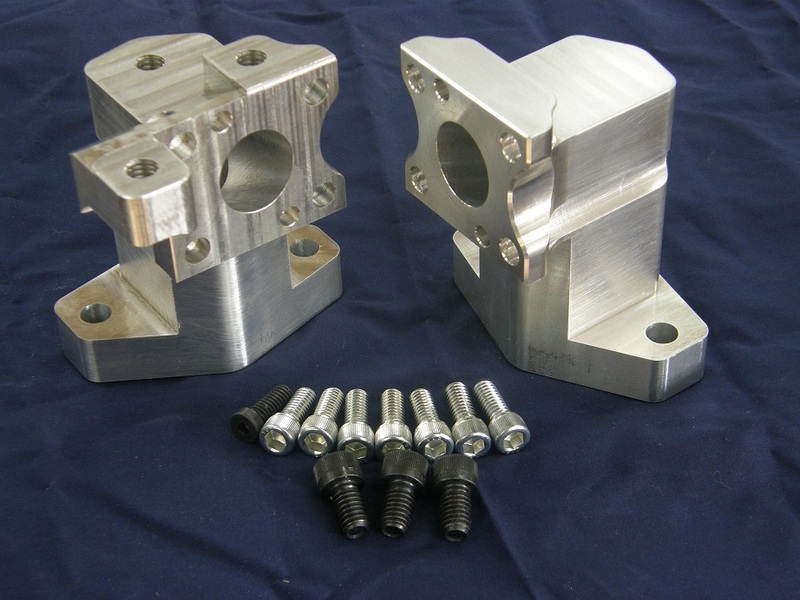 This design also works with aftermarket FE blocks. The groove for the O-ring on the passenger adapter side is round, because the hole on the factory blocks on the passenger side is also round. The photo shows the water pump adapters attached to the CVR pump. Adapter pricing for the SOHC set is $185, and the part number is 12004.